↑ Итоги переписи населения Республики Казахстан 2009 года [Results of the population census of the Republic of Kazakhstan 2009]. Stat.kz (Russian में). 4 फरवरी 2010. ओरिजनल से 12 फरवरी 2010 के पुरालेखित. पहुँचतिथी 1 जून 2010. 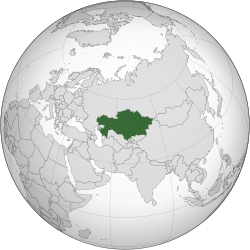 ↑ 5.0 5.1 5.2 5.3 "Kazakhstan". International Monetary Fund. पहुँचतिथी 28 जून 2014. ↑ "Gini index". बिस्व बैंक. पहुँचतिथी 21 November 2015.